Suffolk clay lump buildings are an increasingly rare structure,all too often they have been patched up using inappropriate materials which over time contribute to their downfall( literally!). It is a great credit to owners who realise the special nature and character of these vulnerable buildings and then make the commitment to restore them using traditional materials and methods. One such is a lovely little cottage tucked away in mid Suffolk. When found it had not been lived in for years, was in a very poor state generally and the clay lump had been patch repaired with concrete,brick, block and cement . To make matters worse, the ground level to one side had been built up over the years so that it was now some 400 mm above the original,over the flint plinth course and drawing dampness into the lump. Cement rendered inside and out, the poor cottage was not too far from collapse in places and in fact some professionals claimed it would be best to demolish it and start again. Luckily the owners appreciated it’s special qualities and the real character that these buildings have and decided to restore and repair using the specialist experience of The Green Man Building Company. First job ,to carefully reveal,all the bad repairs and assess the damage caused,this meant removing the increased ground level, the cement render and the many patch repairs in brick, concrete and modern block,while at the same time ensuring the cottage could still stand on its clay lump core. Once stripped back a restoration plan was established and we began to put things back together using skills and materials appropriate to clay lump constructions. We have now completed the inside, lime plastering the repaired walls and re pointing the flint plinth course. Part of the investigations discovered that the floor was now a concrete one , that was driving moisture up into the walls, so that was removed and an insulated Glapor and lime Crete floor installed, so now the inside is sound, warm and dry! The lime Crete and the Glapor were provided by Ty-Mawr lime www.lime.org.uk ,who were as always great with their specialist advice. Next job will be to repair and lime render the outside,once it has had a chance to dry out and the weather to warm up .We will source our lime render from Anglia Lime Company,a Suffolk based specialist supplier. More on this ,including images ,on the Green Man Building Company web site and an update on the external restoration to follow. Clay lump is a traditional form of construction, using earth with a high clay content,straw,animal dung,chalk/flint etc. In some areas of the country the name and the form of the material is diferent- cob ,for example is well known as a building materials in the west country, but here in East Anglia, Clay Lump is the term, the mixture formed into blocks and used as a construction material. Usually this has been used for vernacular buildings, barns, single storey workshops and workers cottages etc. Clay lump buildings have been treated so poorly in the past and few survive without having had extensive patch repairs through the years,often with inclusions of the dreaded cement, breeze block, corregated iron, you name it! So very often the walls have been cement rendered inside and out, which may hide the damage ,but for sure the problems are just begining under the render! ( see the blog entry on cement renders). Properly understood they can be repaired and brought back to a useful state and can add a great deal to the character of a building, even when lime washed over, the pattern of the blocks and the texture of the earth will to an extent show through. If the clay lump is to an outside wall, it is best to LIME RENDER over, but with empathy for the subtle contours of the wall which give it the character that can be totally concealed under a modern approach to rendering. Repairs to collapsed clay blocks and those that have been patched with cement, brick,tin and anything else thrown at it can be made using replacement clay lump blocks using traditional methods,so that the whole can be sound again. The inclusion of materials other than clay lump can cause weathering and breathability issues,so best to take them out to ensure a consistent material throughout. Structural issues can be addressed either by a rebuilding of the failed area,or the inclusion of stainless steel rods- the only time we would use other than the clay lump and only as a last resort. In all this the key is to retain the structure as it is that which forms the character and allows the building to continue on as a useful building- when buildings have no use they become vunerable to demolition and another part of out architectural heritage is gone forever! The Green Man Building Company LTD specialise in this type of repair and restoration, you will see on our web site a number of such buildings that have been given another lease of life thanks to owners who care about their property and have engaged us to bring out the best and celebrate the structure for what it is. Our specialist materials are sourced as locally as we can achieve, we use Bulmer Brick and Tile www.bulmerbrickandtile.co.uk , Our lime products are often sourced from : Anglia Lime Company www.anglialime.com . We are always happy to discuss the repair and restoration of period buildings, in particular those with a little quirkyness, those with structural issues and of course, the ones at risk. We work WITH the building, using our extensive experience to bring out the character of the materials used be it clay lump,clunch , flint, brick or stone, we will work with that which the building presents and the client desires. This is one of the most common requests that come in and a problem that if not dealt with can lead to some very serious issues. All too often we see a period property with solid brick walls covered in a cement based render. The thinking used to be that the render would keep the water out and hence the inside dry, but far from it! A cement based render unlike a lime mortar ,is not a breathable material and if you think about it, we produce a lot of moisture INSIDE the home-cooking showers,etc, even our breath creates moisture that has to go somewhere. If the home has sealed unit double glazing, draught proofing and all the good ,sensible elements of energy efficiency, then where does that moisture go to?-you can install trickle vents etc- good ventilation is essential, but some of that moisture will attempt to escape through the walls and if there is a cement render on the inside and or out side, that’s as far as it will go-just sit there as a damp patch either as condensation on the inside or in the brickwork. 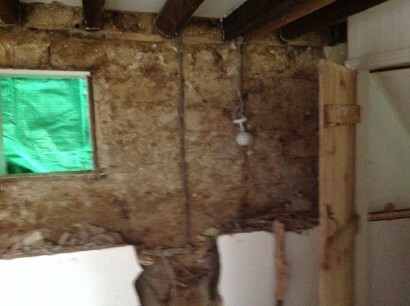 As soon as most materials become damp they loose their energy efficiency and the problems begin. Moving to the outside, a cement render is a strong, but suprisingly brittle substance- it does not like being moved! Period brickwork ,especially with timber framing will move a good deal- enough to crack the cement render-you will often see this in a cement render of a few years old.Take a moment to view our ‘case study’ on one such timber framed building on the web site, it shows the damage that cement renders do to period homes! These cracks become the enemy as they do the reverse of the intended purpose- they will let moisture in the form of rain INTO the wall through the cracks, the softer brick will then soak this up and the moisture then finds it difficult to escape out through the render barrier efficiently- wet walls and worse than this if you have timber framing, wet timber, with the risk then if wet or ‘dry’ rot setting in. Even 19th Century homes can have timbers in the form of wall plates and window lintels built into the brickwork- these are then at great risk of undermining the structural integrity of the property. Our approach is always to try to restore the brickwork if we can- we can carefully removed the cement render and once revealed we can assess the cost efficiency of restoration. In most cases the client will want the brickwork restored, after all it has done a good job for many years and with the damaged bricks replaced and the wall re pointed using an appropriate lime mortar there is no reason why it should not continue to do so. The wall can then breathe as it should ,with no barriers the wind and sun can evaporate the moisture efficiently, the replaced bricks and the new lime mortar keep the inside of the walls dry. A restored period brick wall is a joy to see and brings some of the original glory and that all important character back to the home. One of our most frequently asked questions! Buildings are rendered for a reason- to hide ugly and failed brickwork, to keep out dampness,to ‘brighten up’ an area -cement based renders are and have been used as a ‘cheap’ solution to the problem-they turn out to be far more expensive in the long run due to the damage they cause. In most cases we can do something about it,arriving at a cost effective solution that allows the wall to breathe again,thus helping considerably to reduce dampness and condensation issues. Just as big a plus is the aesthetic consideration- the bricks,once restored will enhance the appearance of the building and in so doing add value too! It takes experience and forethought to remove render effectively-just going at it with a hammer and chisel might get the render off, but in so doing a great number of the probably soft bricks, would also be damaged beyond restoration. The key is to be able to remove the render with as little impact to the wall as possible-approach at a shallow angle to the wall and not too hard!This will lift the render away in sheets with luck and leave you with bricks hopefully whole, but if not ,then not completely shattered. Keep a close eye out for those special features that may have been covered up -arches,doors etc are very common and once exposed they can be restored as part of the story of the building. So, the render is all off and you are faced with a patchy brick wall with holes here and there ,damaged bricks and hopefully a feature or two that you did not know existed-what now? This is where our experience comes into play as we can advise you on the viability of restoration in terms of your budget and the condition of the bricks/stone etc. restoration is not a cheap solution- that is probably why the wall was rendered in the first place, but look at the damage a cheap solution caused!! There is no wall that cannot be restored, given it is structurally sound that is. The issues are budget and function- these walls were meant to breathe- the guys that built them knew what they were up to and stopping the breathability by rendering over got you where you are! 1. full restoration of the brickwork,including a re point,replacement of damaged bricks with MATCHING ones of the period,restoration of features etc. 2. preparing the bricks and mortar for a lime washed finish. The lime wash finish allows the wall to breathe, but the restoration process can be quicker as we are aiming to show the pattern of the bricks and mortar through the limewash,rather than the full colour of the brick. Lime wash comes in a range of usually pastel shades and is relatively easy to apply, once you understand the way it works! It can be cheaper than full restoration and can certainly brighten up a wall, but still allow it to function as it ought. Lime wash is reversible too,so restoration is possible at a later stage. Lime render is a breathable solution,replacing the cement render with lime presents the same or very similar final finish,providing it is left as a lime render finish or a lime wash pigment is applied,rather than a modern masonry paint. Do ensure that any angle beads,drip beads and mesh to hold the render is stainless steel as the lime will quickly attack the cheaper galvanised versions. The render should be applied in two to three coats with time to part cure in between-a slower process, but worth doing it right! It is essential when working on period buildings, that the make up of the existing mortar is taken into account in terms of texture,ingredients and colour. Take time to find out about your building, the texture ,size and colour of the brick,its age and the make up of the mortar. Analysis of the existing mortar will provide information that will guide the mixture of the new lime mortar and help to achieve a close match,not only in colour,which is the obvious one, but strength absorbency and texture which will aid durability and the all important breath ability. The new mortar does not want to be too strong,especially important when working with the traditional low fired period bricks as a strong mortar will lead to erosion of the brick,spalling and other issues such as cracks running through the brick, rather than the ‘sacrificial’ mortar. Important too to ensure that the joints are raked out to the appropriate depth( at least 1 ½ times the width of the joint), flushed out with copious amounts of water to remove dust and the whole area to be re pointed dampened prior to staring work. The re-pointing will cover a good area quite quickly,so an organised approach to dampening is essential,especially in the summer months. After pointing and the subsequent jointing up of the mortar the wall needs to be kept moist by covering with hessian which can be lightly sprayed over to retain the moisture-rapid drying will ruin the results and the whole thing will have to be started again! Keep it covered and damp( NOT wet) for a couple of days at least in the summer. It all sounds simple and indeed, with preparation, practice and patience the novice can achieve a reasonable result, but do practice on an area that is not in full view first! The role of our fireplaces has altered though the years- once simply a ‘hearth’ in the centre of the floor with a hole in the roof to let the smoke out( if you are lucky! )-in other words, originally a totally functional thing ,which through centuries of evolution has become both functional and aesthetic- a place in the house to sit by in comfort, be it a labourers cottage or a grand house, most of us share the essential attraction of warmth, the crackle and aroma of logs burning. Fashions come and go and with it fireplaces are altered, Blocked up, removed, reduced and rendered over , but if you look hard enough( and know what to look for) there will be clues that can lead one back in time and reveal glimpses of that original ‘character’. It often falls to us as specialists to sensitively unpick the various changes in the history of a fireplace to arrive at a solution that seems right for the client and the house-This is the fun part! Starting from what we have in front of us the aim is to work with the client and the property, its materials, building techniques and styles , bringing our practical experience into play so that together we can identify what is desired, practical and affordable. Often at this point there will be input from Conservation Officers as much of our work is to listed or scheduled properties- Conservation Officers have the best interest of the property in mind and have the overview of the local area they work with, bringing a wealth of local knowledge ,for example, similar local architectural features ,or indeed informing you that your property has features unique to the area. We will begin our work with an initial survey to assess the structural implications of ‘unpicking’ later additions/alterations. This is crucial and takes experience- one has to try to understand why builders did what they did – we all know that this can sometimes be a challenge in itself! Usually though there is a logic to their input –a wall to reduce the size of the flue or fireplace is unlikely to be a structural element , but a wall underpinning a damaged beam of course is a different matter! The survey will inform the likely age of the fireplace, which of course need not be the original age of the property, this dating through the clues left behind- brick size, mortar, hearth remains, beams and other features such as the scars left by ranges being cut into the brickwork, all in the context of the rest of the house can help to build a picture of the house through time. Once the survey is complete we can move to the stage of how much/little needs to be done, but it is essential to let the house ‘speak to you’- listen to the clues that it has left and use them as a guide to achieving a solution that sits comfortably with the house and the client. So, is it to be conservation, restoration or re design? All three in their own way, represent the ‘story’ of the property- its journey through time and the people that have cared for it- some approaches take it forward at a pace, others more slowly. ‘hands on ‘ approach, we can offer training and guidance as part of the service. We have to work with what we have in terms of client brief and the clues from the house to bring about a solution that works and is in sympathy to the original or the period that the client is aspiring to get to. It could mean a complete restoration from uncovering the blocked up fireplace to inserting a reclaimed beam, bread oven, re pointing and laying a reclaimed hearth using local materials such as pamments, floor bricks or stone. I think restoration is our favourite – it requires skill, detective work, experience and yet allows for a little creativity too! Some modern design, especially Scandinavian ,can be stunningly simple and elegant, taking the period home onto the next stage in its long story. We of course would ONLY use lime mortars- blended to suit the needs of the brief and also reclaimed materials unless a re -design calls for modern elements. Materials brought to the property ought to be sourced locally if possible, should be sound, and in the case of bricks ,should be matching in terms of colour, texture, size and absorbancy. The first priority is to ensure that the structure is sound and any element removed are safely taken out . The brickwork can then be dealt with and beams etc inserted, cleaned up and a hearth laid- each project is unique and requires a bespoke approach- it takes time, skill and patience, but the results are always worth the wait! Our extensive range of local contacts for reclaimed materials makes sourcing these a lot easier. We also have close contacts with a range of other trades from painters and decorators to plumbers and carpenters, all sympathetic to period homes. As members of the GUILD OF MASTER CRAFTSMEN http://www.guildmc.com/consumer/ , our work is regularly vetted for quality of workmanship and customer service, it shows that we have a professional approach and that we will always offer an after care service. 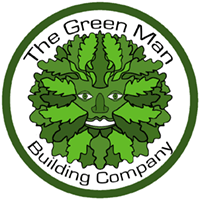 If you wish to make an enquiry regarding our services for fireplaces and/or any other period restoration to your home , please do contact us through the website- www.thegreenmanbuildingcompany.com and we will be sure to get straight back to you.